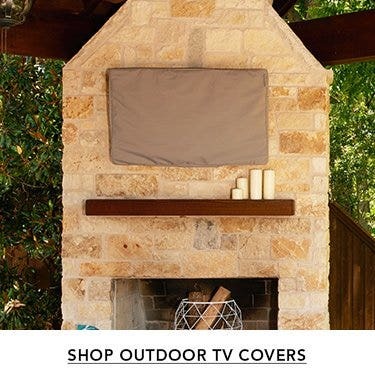 Protect your outdoor chiminea with a custom-fitting Covermates Elite chiminea cover from Coverstore. 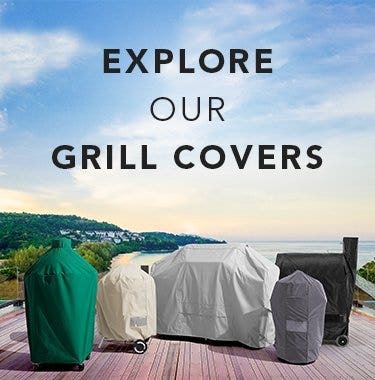 These unique covers are form fitting to follow the general profile of traditional chiminea styles. 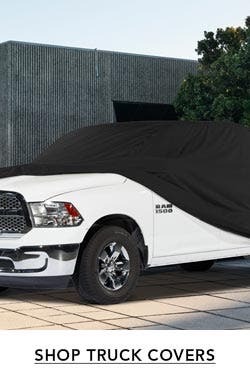 Covermates Elite covers come with an impressive three-year warranty so they will offer many years of protection from rain, snow, dust & dirt, tree sap, bird droppings and other natural elements. 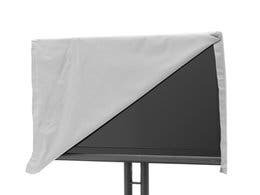 These covers are made of durable 300D polyester that has been chemically treated to resist moisture and block damaging UV from the sun. 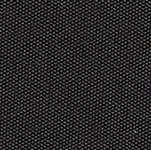 Polyester is a popular cover material because it is lightweight and stays soft in warm and cold temperatures. 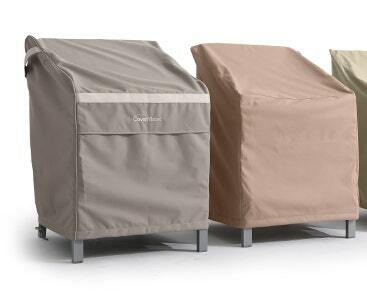 All Covermates Elite chiminea covers are designed with special drawcords and locking system. drawcords ensure that the cover stays snug to the chiminea. 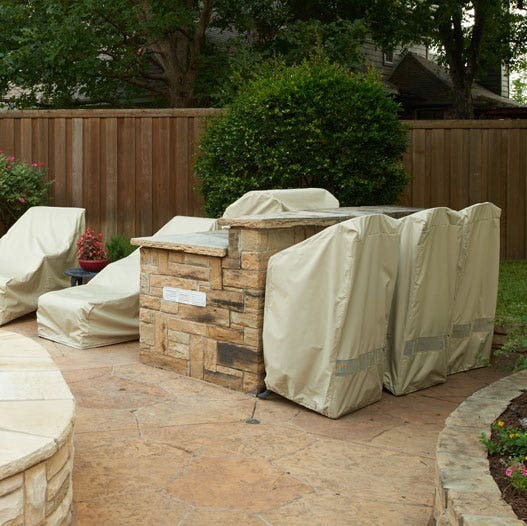 These special features set Elite chiminea covers apart from the rest and provide superior protection and value to anyone looking for a chiminea cover. The product is wonderful and the service was amazing. I would do business with this company anytime. The cover fits our Blue Rooster chiminea better than the one from Blue Rooster and is a better fabric. The bottom comes just below the bowl, so it will keep water out but wont wick water from the ground. 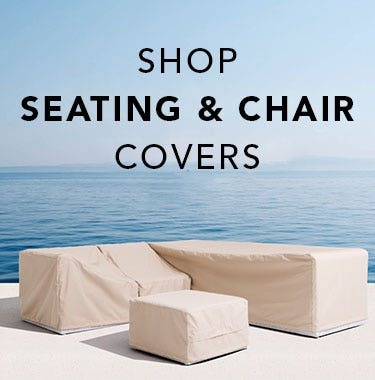 We have Elite patio table and grill covers which still look great after 11 Ohio winters - I have the same expectation for this cover. Looks good and fits good. Although we ordered the size that most closely corresponded to our chiminea, it doesn't fit well, The top section is too long and narrow which doesn't allow the cover to fall over the round bottom portion, so much of the chiminea exposed. The quality seems to be okay, but it's brand new, so only time will tell. Received the cover before the anticipated date of arrival. Pleased with the product. It fits good. I have only had it on the chiminea for a couple of days. Will see how it holds up over the next three years (warranty). 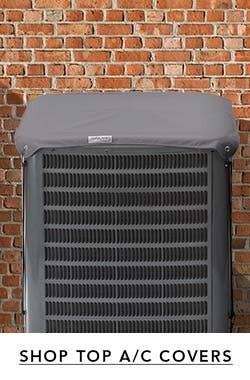 I ordered an air conditioner cover in the past and have been very blessed with it. Nice quality. I think the cover will last a long time. 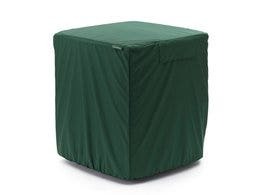 i have been looking for quite a while for a cover to fit my chiminea, without success.  this one not only fits like a glove it is made of a durable soft material that sheds rain nicely. delivery was quick, too! Good quality cover, well made. Fit was not as expected. Odd size chiminea. Made it work. Happy with purchase. Patient help and understanding with the order. A very good experience. Cover fits perfectly and is well constructed. Only in use for 10 days so once winter is over, I will know better how it holds up to the elements. Cover is well made but unfortunately, not a good fit. Although I measured before ordering, my chiminea isn't the same shape as the cover! Not something that could be seen before ordering. Very quick service! Cover fits our Home Depot Chimnea perfectly. Co er is stirdy, well designed. Elastic band around the bottom is a real plus. Great cover for the money. I love the cover! 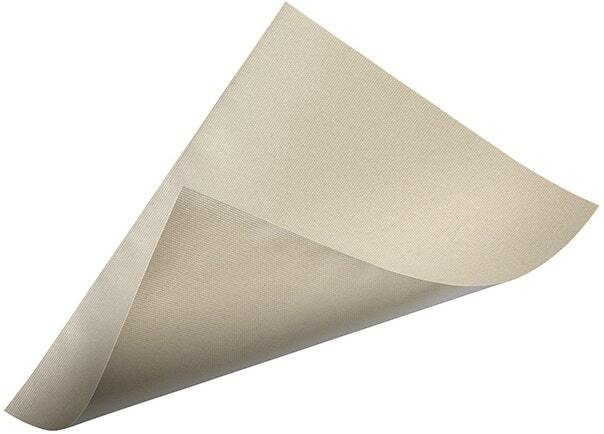 It is of good quality material and is a great fit. Thanks again for a wonderful product! The cover is great. I passed on the information to Gayle Stewart and she order a cover for her Chiminea.I have ordered several covers from your company and have had no problems.Thank you for such good service. This is not the 1st product that I Have bought from The Cover Store. I'm very happy with the product. My only grievance was that it came only in Black. 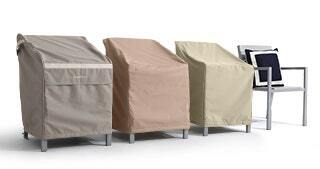 We have chosen the Beige color for our back yard due to the color scheme of our landscaping, however my wife loves that the Chiminea will be covered. The cover was well made and fit perfectly. shipped promptly, arrived in good condition, fit nicely, a good buy! I suggest asking about the length of the narrow chimney portion vs the wide body portion of the cover. My cover didn't fit because the chimney portion was too long, which left extra material up top, which in turn stopped the cover from being pulled down fully, to the length I ordered and needed to cover the body. Otherwise, a quality product. So far, great cover for our chimenea. The chiminea cover I ordered was just what I was looking for. Very satisfied. Great product. Had to return 24 inch and reorder 28 inch. Shipment very prompt. If your chiminea measures 24 diameter, better order the 28 so the elastic goes over the bottom. Nice quality material and fits like a glove! So LOVE the way this fit our chiminea! Thanks for making such a great product! I love this cover. 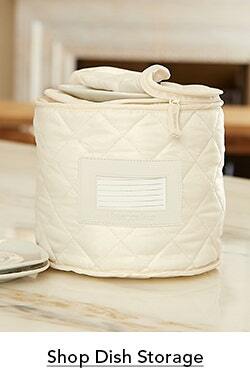 It sure beats plastic bags and shower curtains lashed on with bailing twine. Fits good, looks good and appears to be made very well. Great product! The elastic at the bottom is great and allows for easy on and off access. Most chiminea covers are made from that hard plastic that cracks and rips in the sun. This cover however is very high quality and will outlast the cheap ones over and over. I would purchase this product again! My eight-year old cover had seen better days and needed to be replaced. 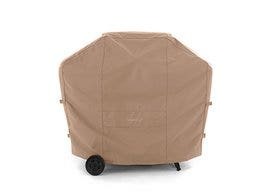 While the cover is a little large for my wood burner (shaped like a chiminea but not as tall)it completely covers it and is easy to put on and take off. GOOD QUILITY, GOOD PRICE, AND PERFECT FIT. The cover fit perfectly. The only reason I gae it a 4-star rating is because I want to see how it weathers the winter. Very happy so far. It's great! I have to say this seems a bit premature, since a lot of its value will be in how well it lasts in the next couple of years (the one that came with the chimminea ripped after 2 years, and I'm hoping this one lasts longer).I thought I would be evaluating the service and though you didn't ask, I'll do so anyway. It was excellent and made on-line shopping very easy as well as reliable. Thanks! After receiving the second cover (the first one did not fit well due to our incorrect measurements) we are very happy with the new cover.Fits perfectly and good quality from top to bottom. Will not hesitate to order again from the Cover store. Arrived very quickly, quality is very nice. just got this cover, and so far, so good. it fits my chiminea perfectly, and water beaded and rolled right off. only had it for a few days, so i can't comment long term, but as of right now, i have no complaints. Excellent! Protects our chiminea from the elements.